Green Tea and Velociraptors | Your track or mine? EGU Blogs » Network » Green Tea and Velociraptors » Your track or mine? How do you tell between different dinosaurs, when you don’t have any dinosaurs? Trace fossils, like footprints, are ghosts of dinosaurs past, remnants of life entombed within the rocks. Palaeontologists and ichnologists (scientists who study trace fossils, not fish) often used to get confused by the question of matching a dinosaur track to its maker. Dinosaur tracks are known from multiple localities all around the globe, but figuring out exactly which dinosaurs made them, or even what type of dinosaur, has always been a mystery. How do you tell the difference? A classic example of this uncertainty is between the tracks of ornithopod and theropod dinosaurs – both groups walked on two feet (bipedal, mostly – some ornithopods were variably quadrupedal), had the same size ranges, were clawed, and had three front toes (mostly). This means that often, the trackways looked quite similar, not just in terms of gross morphology, but also in the stride length, which tells us about how fast an animal was moving at the time. An international team of palaeontologists, ichnologists, and biomechanicists (scientists who work on anatomy, structure, and motion in organisms) have earthed new evidence of trackway-trackmaker distinction from a complex series of trackways from the Late Jurassic to Early Cretaceous of Spain, in the Teruel region. Footprint size and shape are the result of two interacting parameters: track formation, and track preservation; the former relates to the trackmaker, and the latter to the nature of the sediment which it formed in, and how it transformed into the rock which preserves it. You have to unravel the latter to be able to infer the former, which is arguably the target of most ichnological studies. Ornithopod dinosaurs varied between being obligate (all the time) and facultative (some of the time) quadrupedality, often depending on their size and how this affected their centre of mass. 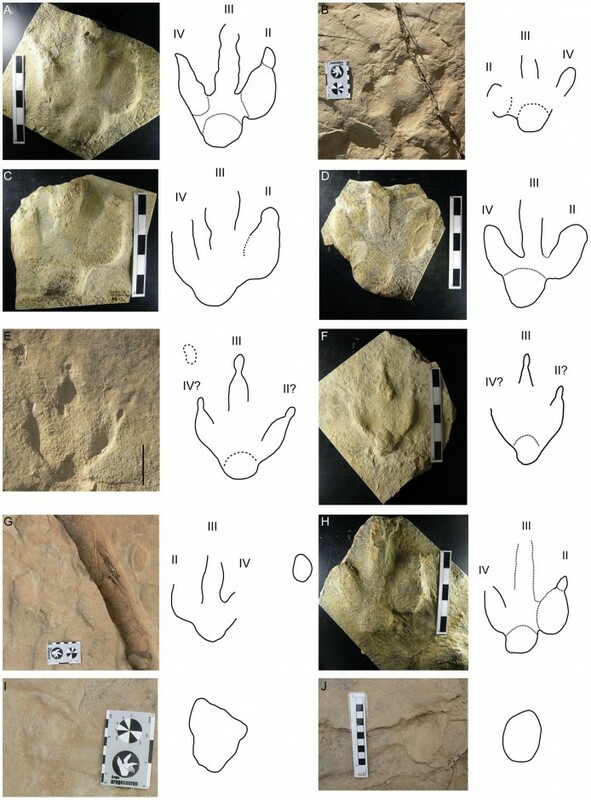 This means that not only did they leave the typical tridactyl footprints, but also softer manus (hand) impressions, creating a pretty cool way of otherwise distinguishing between certain types of ornithopod and theropods. Using this information, the team, combined with recent uncovering of more trackways that can be assigned to quadrupedal ornithopods, sauropods, and small to medium-sized other tridactyl trackways, looked at some of the preservational biases that influence the way in which we interpret trackways and their subsequent assignment to trackmakers. Next comes the wizardry part. The team labelled all of the tracks and trackways, and then scanned the entire range using LiDAR (Light, Detection, and Range), a laser-based data acquisition method that gives a detailed image of all the tracks in space. 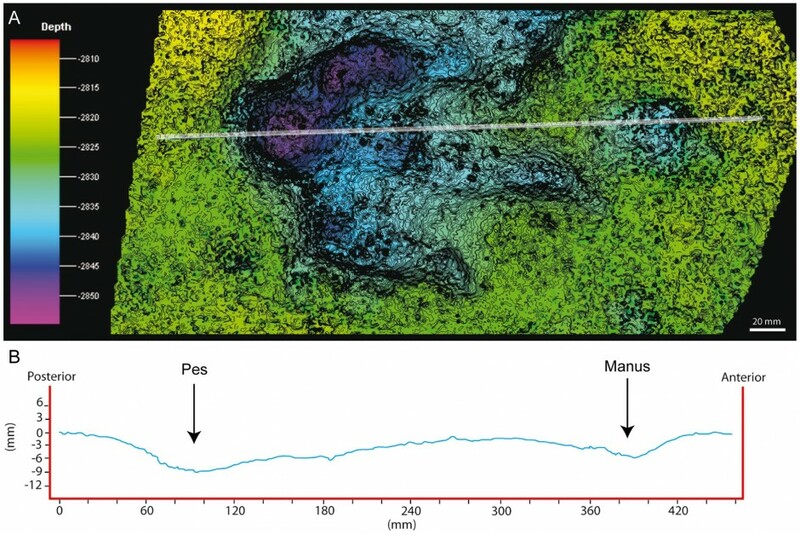 This was combined with close-range photogrammetry, using handheld laser scanners and cameras, to give even greater detailed digital images of the individual tracks. What this provided the team with, is a detailed morphological (shape and size) and stratigraphical (position within the different rock layers) of all the different tracksites, allowing them to look at the preservational biases that influence trackmaker identity. 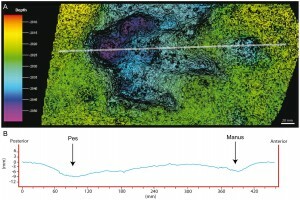 They found that there was a clear bias against the all manus tracks associated with three-toed (tridactyl) footprints. 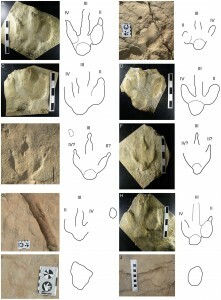 These manus tracks make a clear distinction between ornithopod and theropod trackmakers, but are still not enough to identify them to a more specific taxonomic level. In some layers of rock, there is a lack of manus tracks, but still tridactyl tracks. However, looking at these, they have a different depth of preservation, due to the position of the centre of body mass more towards the tail of the organism. 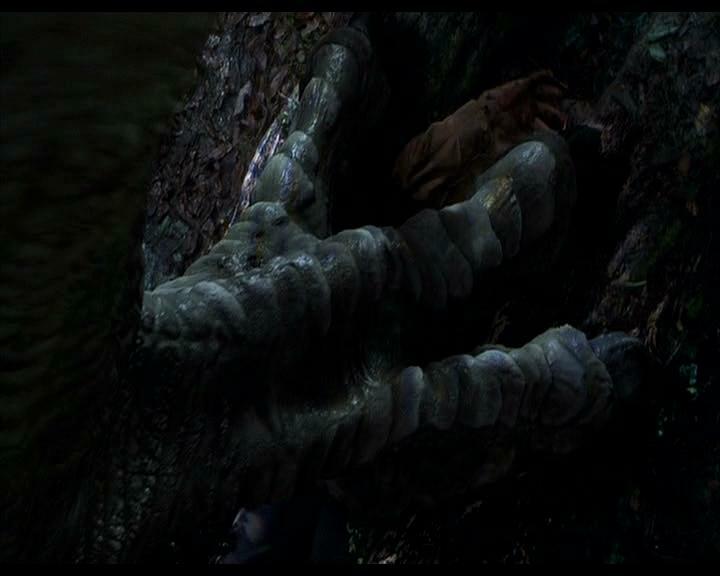 This means that there is greater mass acting upon the hindlimb (loading), pushing them in deeper into the soft sediment relative to the manus prints. This in turn implies that if there is equal erosion of these front and hind-prints, the hind ones would be preserved to a greater depth and more likely to survive the ravages of time. What this tells us about the trackmaker, is that it is more likely to have been a quadrupedal ornithopod than a bipedal theropod, but the true nature is disguised by the nature of the rock. So combining the stratigraphic penetration of prints, a knowledge of how an animal moved, and how sediment responds when an organism walks on it, allows you to unravel the mystery of the trackmaker! But who did these tracks belong to? Back in the Early Cretaceous of Spain, there were only two mediuim-sized ornithopods: Camptosaurus dispar, also known from Wyoming (USA), and Mantellisaurus atherfieldensis, also known from England. The team, however, think that neither of these are appropriate given the way in which the footprints are preserved in the rock. 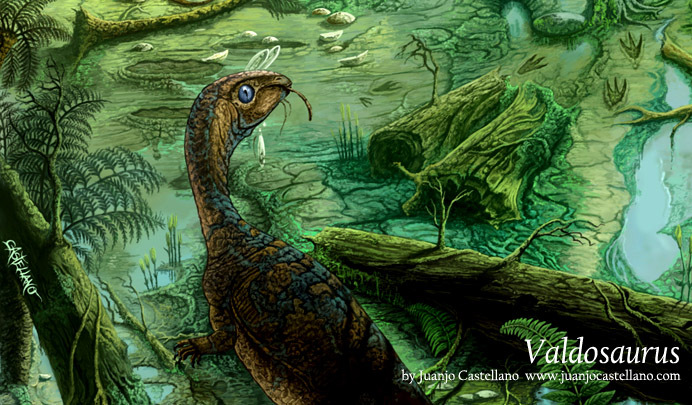 Valdosaurus, a smaller ornithopod is known from a tooth, so could be a potential trackmaker, or it could possibly have been a juvenile specimen of one of the other species. Could this be the mystery trackmaker? Source. This also tells us a bit about ornithopod locomotion evolution. Ornithopods can be roughly grouped into ‘grades’ with distinct body plans and modes of life. The first, and earliest of these are ‘hypsilophodontids’, such as Hypsilophodon foxii from the UK. These were small, bipedal, and speedy Jurassic snacks. The most advanced forms were ‘hadrosaur’ grades – big, facultative quadrupeds but capable of bipedal running, and found in the later Cretaceous. The intermediate between these, ‘iguanodont’ grades, as these three above genera belong to, have complicated relationships and understanding of their locomotory evolution. This study suggests that at least by the Early Cretaceous, iguanodonts had adopted a quadrupedal movement stance. So this is another example of the value of trace fossils to scientists (compared to the previous post on dinosaur skin), as well as the interdisciplinary nature of palaeontology. It really is just like a crime-scene, and we are tasked to deduce the criminal from a few remaining decayed clues. It also shows how we have to be very careful about what we interpret directly from the fossil record: often, what we find has been obscured and altered by the geology, as we see at this locality by the absence of manus prints potentially misleading the interpretation of their maker. DINOSAUR! But what does it mean..?